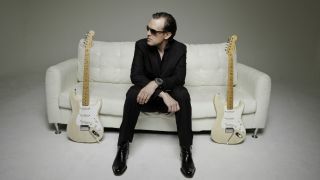 Between his solo career and bountiful side projects, Joe Bonamassa never stops, but he's found time to hit the UK in March 2015 for a run of four dates at London's Eventim Apollo - and you could win a pair of prime seats for the opening night. We have a pair of Category 2, seated Circle tickets - worth £200 - for Joe's gig on 17 March 2015 to give away to one lucky winner - click here to enter! Even if you don't land the tickets, you can console yourself with a free download of Joe's latest track, Lonesome Christmas, from his official website - click here to get it!